Wow, nice! I think I have seen this one before. It isn’t the site at Thanksgiving Forest in Chelmsford right? Hello and thanks for dropping by. This is located in Central Mass. Do you have more info on Thanksgiving Forest? Hi Henry, Thanksgiving Forest is located on the town border between Carlisle and Chelmsford. I believe it was settled by the Wilson family. In my walks there I observed some interesting rock features. It has bedrock outcrops but I suspect I observed more there. I would love to walk it with you. The Thanksgiving Ground Forest is a 45-acre Town Forest in S. Chelm. It borders on Russell Mill Pond’s west bank and the Great Brook Farm State Park in Carlisle to the south. The area gets its name from the historic annual gathering of the men of the Town at a mass of boulders each Thanksgiving Day for a fox hunt. The forest is a mix of hard and soft woods. 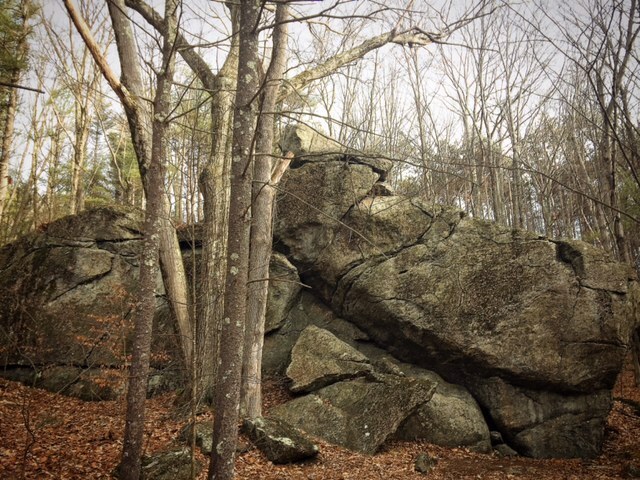 There are also enormous outcroppings of ledge and massive boulders on the property. The extreme southern end of the Forest brings one to the upper end of Russell Mill Pond, where River Meadow Brook enters the pond from Carlisle.